Palicte and Nietes ordered to negotiate WBO title fight! Last week Filipino puncher Aston Palicte (25-2-1, 21) battered Puerto Rican Jose Martinez (20-1-2, 13), in just 2 rounds, in a WBO Super Flyweight world title eliminator to net himself a mandatory title fight. Despite the fact that bout took place less than a week ago the WBO have already ordered Palicte, and his team, to begin negotiations with WBO world champion Donnie Nietes (42-1-5, 23), who will be making his first defense. 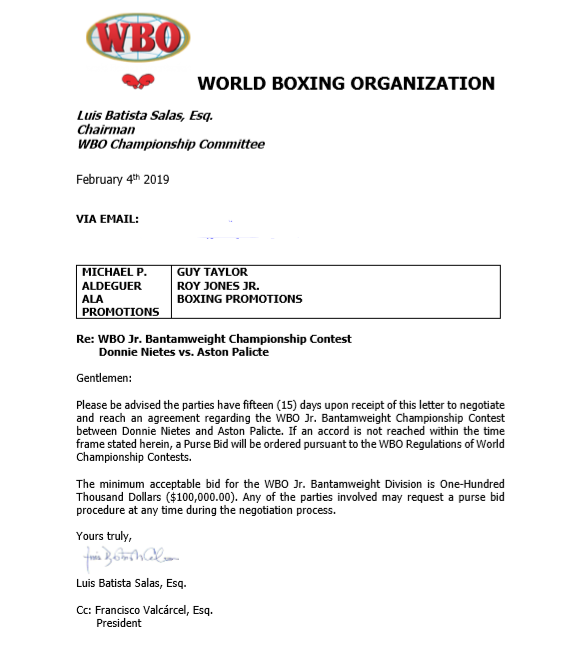 The WBO, as per their letter to the teams of the two men, have got 15 days to come to a deal or purse bids will be ordered, with a minimum bid of $100,000 (USD). This will be the second bout between the two men, who fought to a controversial draw last year, and is set to be the third all-Filipino world title bout within the space of just a couple of years follow over a break of over 90 years between all-Filipino world title bouts. We've included the WBO's letter to the teams above.